Think your cat is looking thinner? 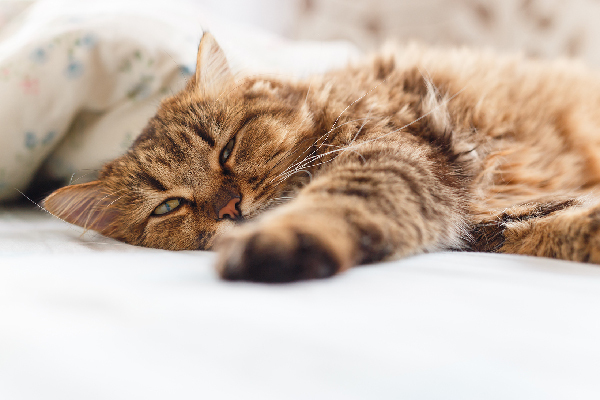 Is your cat losing weight? 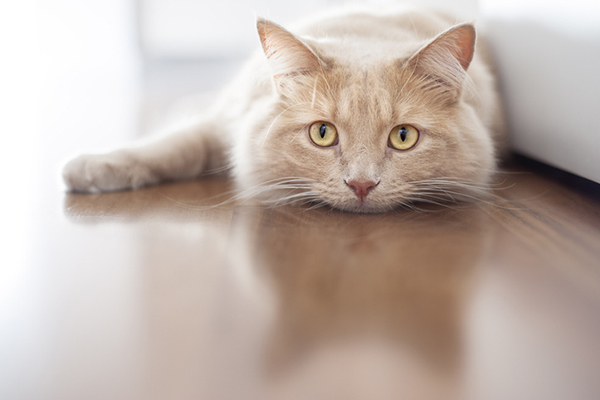 Here's how to tell if your cat is losing weight, what issues could be at play and what to do. Is your cat losing weight? Cats may lose weight for many reasons. Sometimes, weight loss is a good thing. If your vet recommends that your overweight or obese cat needs to shed a few pounds, a change in diet and increase in daily exercise can help your cat slim down. However, if you’re not specifically trying to get your cat to lose weight, but you think she’s looking smaller than she used to, the weight loss might signal a health problem. An older cat might be losing weight due to a few different diseases. Photography © Tanchic | iStock / Getty Images Plus. 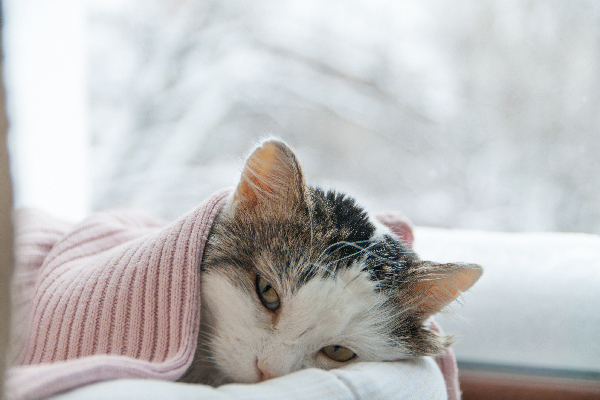 “In older cats, the biggest reasons would be hyperthyroidism, diabetes, lymphoma and inflammatory bowel disease, as well as kidney disease, liver disease or organ disease,” explains Ken Lambrecht, DVM, owner and medical director of West Towne Veterinary Center in Madison, Wisconsin. 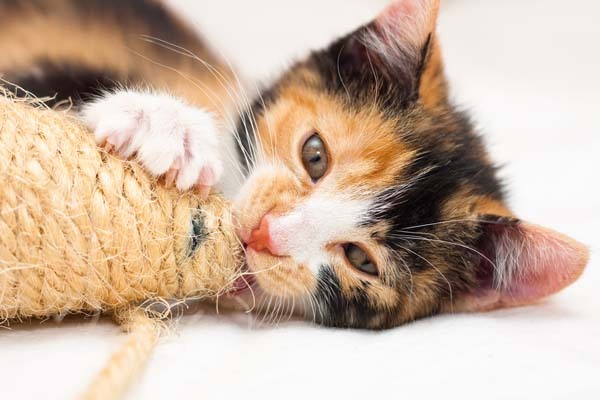 Other things that can cause weight loss in cats include intestinal parasites and dental problems (a cat might avoid eating if her mouth hurts). 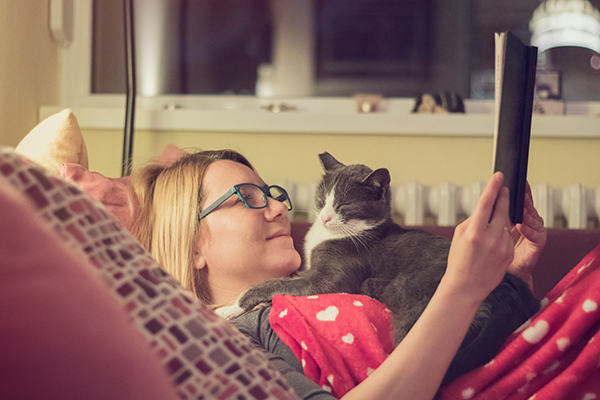 Cats can be very sensitive and some might lose weight due to stress in the environment (for instance, moving, adopting another cat, or a new baby or roommate in the house). The problem with cat weight loss is it can happen gradually, so much so that you might not even notice a cat losing weight until she’s dropped a significant number of pounds. This is especially true if you have a very fluffy cat, as the weight loss may be disguised by your cat’s hair coat. 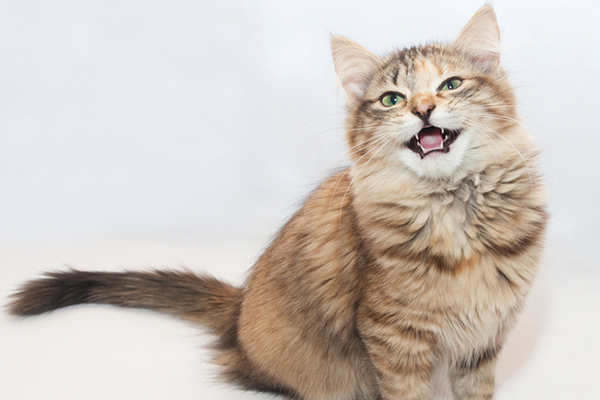 Paying attention to your cat’s behavior and noting when something seems amiss can help you identify trouble early on. It’s also a good idea to run your hands all over your cat’s body on a weekly basis to get a good feel for what her normal body condition is like. “You can do that in combination with petting them and giving them affection, and just kind of feeling muscle mass and general mass,” Dr. Lambrecht says. Thanks to modern technology, it’s getting easier to keep track of your cat’s weight and even bathroom habits. The Tailio, a smart scale that goes under your cat’s litter box, automatically weighs your cat and monitors daily elimination, then wirelessly sends the data to your smart phone. It can even distinguish between multiple cats using the same litter box. Petrics, another smart scale product that will be available in the fall of 2018, goes under the cat’s bed. It automatically weighs the cats and sends the weight to your smartphone. If you think your cat is losing weight, bring her to the vet as soon as possible. A “wait and see” approach is not a good idea where cat weight loss is concerned. By the time you notice weight loss, the underlying condition might have been going on for quite some time. Your veterinarian will do a thorough physical exam and weigh your cat on a special scale to compare her current weight to the weight recorded at her last veterinary visit. The next step is usually bloodwork to check organ function. “If the bloodwork doesn’t show what we need to show, we usually go with an abdominal ultrasound, and that can give further insight to the causes of weight loss,” Dr. Lambrecht explains. Thumbnail: Photography ©Stegarau | Thinkstock. My cat is 2/1/2 years old. Dec 2017 went for a check up she was 10 pounds perfectly healthy. About 6 weeks later she was scratching like crazy losing clumps of hair . We went to vet. She weighed 8/1/2 pounds loss of 1/1/2 pounds. We changed diet. Vet took blood. Sent it out to university of texas for special blood tests. It came back negative. He started growing hair back and stopped itching very soon after. Very playful very happy but he is down to 7.1 pounds seem to lose 1 to 2 ounces a month. We checked stool for paracites that came back negative. Dont know what to do. As I read Jean’s and Joseph’s story, the tears welled up in my eyes. I too have an older cat,14, who was one of two. I had to put my Pepsi cat down first due to lymphoma and 2 years later his brother is losing weight and has the very same symptoms. My heart is heavy because I love my Egypt and I dont want to see him go but I know his time is soon. To live is to love and to love is to let go. I just dont want to let him go but I know he feels loved and gave me all the love he has.. I will miss him dearly. “Take your cat to the vet” Yes by all means take your cat to one of the most outrageous cash gangsters on Earth. Worse than lawyers or medical doctors, these veterinarians bill an obscene amount of money from people who truly love animals. I’ve seen it too many times and it’s probabbly the single most cause for animal cruelty and people’s neglect for their animals. Incompetence of the sake of profit is also widely rampant in the veterinary field. I agree. I’ve literally spent thousands trying to save various cats and dogs, only to have 1 live 2 more days to the tune of $1300. My Ruby, my adopted cat with no records, has been to the vet countless times for horrible litter box, dental, eye, chronic vomiting, and weird howling issues. This has cost me thousands of dollars, but I have done the most good myself to correct these things. She still throws up every day, and is losing a lot of weight, so I have her on chicken baby food with enzymes, vitamins, and hair ball supplements. It seems to be just helping. Not sure what I will happen when I move soon. My most beloved cat of over 18 years has been losing weight over the last few months. I have had her to the vet for every required visit and lots in the interim. Tonight she is dying. I have treated her for a thyroid problem over the last few years with many visits to the vet for blood tests. My dearest “Widget” is over 18 yrs and I am over 81 yrs. We have grown old together and tonight I watch with her while she dies. I refuse to “kill” her as she is quiet and not in evident stress. I have loved her since I found her as a feral baby that had been discarded and brought her home over 18 years ago. Tonight I weep and look for consolation but my little one is dying. I stumbled upon your site and would so appreciate hearing from old folks like myself who are losing their best friend. I hear you . I too have loved my cat since baby. I’m 53 she is 9. Few scares but vet took care . I feel all I have learned about love I learned from my Xena . I can’t imagine how much losing her will hurt though I know it’s part of life . I hope my cat gets to 18 . God bless and know only us cat lovers know truly what life and love can be . Hi Jean, I feel your pain and thinking of you. My 18 1/2 year old cat is dying tonight, I am 64 . When my mom died 18years ago I took in her cat who has owned me since. I’ve tried to prepare ,but one cannot. Just remember they had a good life because of us and better they go 1st, imagine their stress if they lost us. Remember they love us and know they had agood life. Jean, I just read your post and I know it is many months later but my heart hurts for you. I am currently snuggling in bed with my sweet old boy “Buzz” who sleeps in my arms every night. That is fine. He is a good companion and he doesn’t snore but I am worried that he is getting old and my feline best friend will not be by my side as long as I wish. This thought lead me to search on the internet and find this page. Oh how I empathize with you. Sending you love and hugs. Dear Jean; My heart hurts for you! Reading your post I realized you posted it the day my 90 year old mother died, which made me even sadder. Really, the only things that have given me comfort are my 2 kitties who loved my mom and sat vigil with me as she died. One of my mom’s greatest joys at the end of her life we’re her cat and mine, who sat on her lap, purred loudly enough for her to hear and made endless biscuits on her tummy. I’m so sorry you’ve lost your companion and hoping that 8 months later some of that pain has dulled. You might be ready for another go. A middle-age or senior cat, a foster, or maybe just a visiting kitty to get your cat fix. Even some visits to a cat shelter, those kitties need and deserve love and so do you…the unconditional kind that only a soft, furry, purring kitty can give. Sending you a hug in the meantime.